What should vacation parenting time look like and much advanced notice should be given? How much telephonic or electronic communication access should our child have with the parent who is not exercising parenting time? What are the rules for grounding a child with a cellphone? How will our child’s clothing, toys, and belongings be shared between households? What will communication look like in case of an emergency for our child? 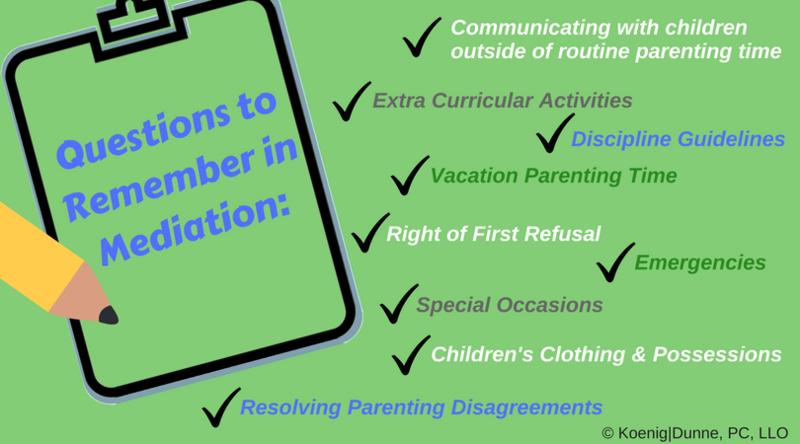 How will we coordinate our child’s extra-curricular activities’ schedule? Are there any special occasions that should be a part of our holiday parenting time schedule? Should we include a right of first refusal in our parenting plan? If we cannot come to an agreement on an issue regarding our child, how will we resolve it? A well-drafted parenting plan can provide stability and consistency to your co-parenting relationship. If some details are left unattended, it can incite the need to return to court. Your legal team at Koenig|Dunne is here to provide guidance and foresight in the mediation process and development of your parenting plan.